Even though bank stocks rallied into the end of 2017, not all was well with their fundamentals as a whole. 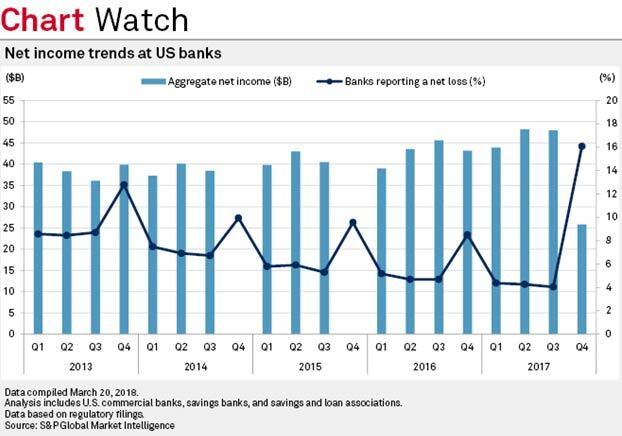 As the chart below shows, 16% of U.S. banks actually reported a net loss in the last quarter of the year. In fact, among the worst losses were huge organizations like Citigroup, Credit Suisse and Goldman Sachs. Under normal circumstances, this looks like something that would lead to another financial crisis. However, while this might seem like a reason to panic, there’s actually a good reason behind it. It’s simply a result of the new tax reform put in place by Congress last December. Part of that tax law resulted in huge one-time tax expenses that were charged on profits earned in other countries. As a result, the banks that do business outside the U.S. were hit hard with a one-time tax fee. Even though this doesn’t look like a favorable chart, banks are still a good investment going forward. That’s because interest rates are on the rise. In fact, the Federal Reserve, which sets the U.S. interest rates, expects them to double between now and the end of 2019. That means that banks are going to be able to charge more for interest on loans, which is the primary way that they make money. So, going forward, I believe that banks are going to be one of the hottest investments of the year, despite the rough ending of 2017 that some of them saw. There are a couple large exchange-traded funds (ETFs) that you can invest in, where you’ll receive a diversified fund of bank stocks. One is the SPDR S&P Bank ETF (NYSE: KBE), which holds a large variety of all sorts of banks and lending institutions. Another is the SPDR S&P Regional Banking ETF (NYSE: KRE), which holds smaller banks that serve specific regions of the United States. As we continue to see interest rates move up, banks should continue seeing higher profits and will be a great place to be invested in.